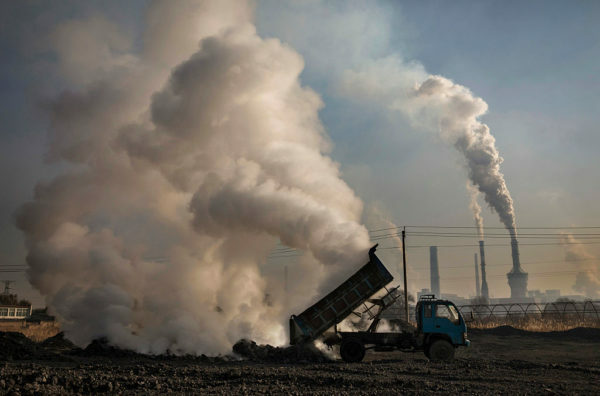 With China’s CO2 pollution on the rise, is it time to panic? Analysts have suggested the country’s carbon emissions could rise this year by 5% — the largest annual increase in seven years, back when the airpocalypse was at its peak. This latest uptick in carbon emissions was unexpected. Many thought the government’s 2016 stimulus – which kicked off a construction surge fueled by coal-burning industries – was a temporary state of affairs, following years of falling coal use and carbon emissions. But big spending on energy intensive industries persisted through 2017, meaning China has been backsliding on the climate progress it made earlier this decade and the rest of the world must redouble efforts simply to ensure global CO2 emissions don’t climb dramatically. For the decade up to 2013, China’s CO2 emissions were the dominant driver of global emissions growth, making it nearly impossible for global emissions to peak. Now government data indicates China’s CO2 emissions went up 4.0% on the first quarter, after a 2% increase in 2017. Calculating demand from government data on production, trade, and industry data on inventories, coal demand increased 3.5%, oil demand 4.3%, gas demand 10% while cement output fell 4.5%. This has led researchers to warn that we could see a 5% increase in emissions from China this year, the largest since 2011. When China’s coal use fell and CO2 emissions stabilized in 2013-2016, this opened a much-needed window for global emissions to peak and decline as required to avoid the worst consequences of climate change. However, in the past two years, the government has been running an aggressive stimulus program that has breathed life to smokestack industries and set the clock back on the economic transformation and clean energy transition that are so crucial for the country’s future. If China’s emissions are indeed going back to rapid growth, it means that the rest of the world would have to run just to stay in place – keep global emissions from increasing. The task of achieving a rapid and sustained decline in global emissions would become essentially impossible. The battle against air pollution has also been made harder by the growth in polluting industries – as Unearthed has been highlighting since summer 2016. As recently as March, the country’s top economic planner said the government would “push forward investment” in 2018, implying a continuation of the debt splurge. Yet there are signs that the most recent wave of stimulus has peaked – leading the Financial Times declare recently that the country’s “lending bubble is history”. This implies that we could start seeing emissions fall in the second half of the year – but it all depends on what the government does next. The increase in coal demand is driven almost entirely by power sector. Power demand increased 6.7% in 2017 and 9% in the first four months of 2018. Growth in demand was mainly driven by demand from heavy industry, with service industries being the second-largest driver. Clean energy has continued to boom: in 2017, the increase in non-fossil power generation was equal to the total electricity generation of Poland, in just one year. This is enough to cover power demand growth up to 3% per year. However, demand growth in the high single digits is too much for even China’s booming clean energy sector to deliver, meaning that much of the growth gets covered with coal-fired power. Most of oil demand growth seems to be coming from industry, as gasoline demand has grown much more slowly than total oil demand, with diesel demand in fact continuing to fall. As China’s emissions were leveling off and coal demand was falling fast, in 2013-15, coal, steel, power and other heavy industry companies started to struggle financially. These usually state-owned companies are saddled with overcapacity and excessive debt levels after they spent massive amounts of capital to stimulate the economy for the best part of the past decade. Local governments, dependent on land sales for their revenue, and with local economies reliant on stimulus spending and smokestack industry jobs, were also ill-equipped for the transition. This financial distress made it clear that the economy was much less ready for the ambitious economic transformation than Beijing had assumed under the slogan of economic “New Normal”. Furthermore, with president Xi focusing on consolidating his political position in the late 2017 party congress, there was no room for economic hiccups that could create internal discontent in the Party. In response, the government unleashed a wave of stimulus that saw the reliance of the economy on government-directed spending and on inflated real estate sectors increase, in direct contrast to the aims of China’s economic transformation. In fact, the economy remains as dependent on real estate bubble and government-driven construction projects as ever, with 1/3 of this year’s GDP target expected to be delivered by a further increase in capital spending, above current very high levels. CO2 emissions have followed the total volume of new debt closely with a time lag of about 12 months – after emissions started falling due to the global financial crisis in 2008, an unprecedented wave of credit started pushing emissions up even faster in early 2010. When that wave of stimulus started to run out in early 2013, it took a year for CO2 emissions to begin to fall. The next wave of stimulus started during the second half of 2015, and emissions started rebounding in early 2016. Now the amount of new credit (“Total Social Financing”, TSF) seems to have peaked in late 2017, but emissions are still on the upswing. China’s coal use remains well below its peak in 2013. Total CO2 emissions could be lower or higher depending on which time series you look at. Note though that there are major uncertainties about short-term data – calculating back from recently published data, coal output in 2016-2017 seems to have been recently revised down by 5-10%, without explanation, which means that the recent increase is just coal demand reaching the level that we thought it was on in 2016. The revisions mean that the statistics initially understated how fast coal use and emissions were falling. It was thought that this wave of stimulus would be short lived, as the government started to signal tightening a year ago. But that now looks less likely. But the fact remains that there is no productive use for the amount of capital, steel and cement that China is spending every year, so a major economic shift is inevitable.